Stokke® Tray: The Tripp Trapp® chair is designed to fit right into your table, bringing your baby into the heart of your family; however, for certain occasions, the Stokke® Traywhich fits on the chair with the Stokke® Baby Set*can be a convenient accessory. Features: Available in clear, BPA-free plasticmade in the USA and certified for food contact by the FDA. For easy cleaning, the tray is dishwasher safe. Risk of tipping overa child hanging on the tray, or excessive weight placed on the tray, may cause the chair to tip overnever leave your child unattended. The maximum weight placed on the tray must never exceed 5 kgs / 11 lbs. When attaching, ensure that both hooks on the tray are properly locked under the edge of the plastic rail before locking it in the middle. Make sure that both the Tripp Trapp® Baby Set and the tray is properly fastened prior to use. Do not leave the child unattended! Can only be used in conjunction with the current model "V2/V3" Stokke® Baby Set and Tripp Trapp® harness restraint system. This accessory will not fit Tripp Trapp® chairs made prior to 2008 or older KinderZeat configurations. 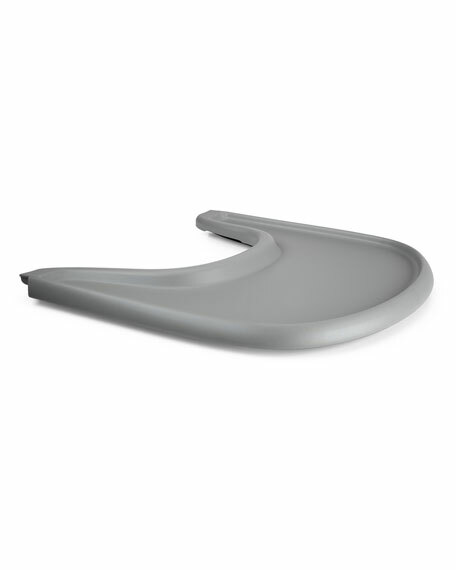 The Stokke® Tray is not designed to hold the child in the chair. Stokke recommends that you always use the Tripp Trapp® harness when your child is seated in the chair. Please note it is recommended that a high chair be used only by children capable of sitting upright unassisted. User Guide contains important instructions to insure safe installation of the tray which can only be when fastened to the Stokke® Baby Set. Be mindful of weight restrictions also outlined in user guide.